The donkey’s herding and territorial instinct, combined with its inherent dislike for all canines, domestic and wild, can make it an effective Guardian animal. 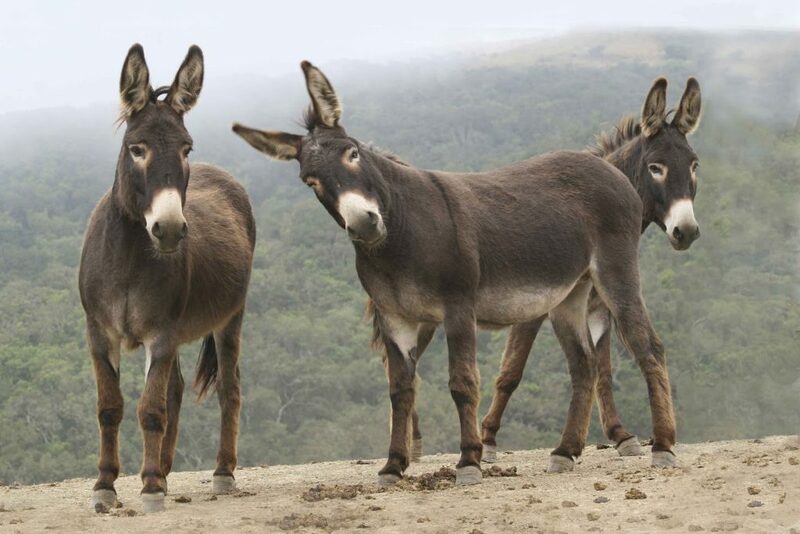 Donkeys rely predominantly on sight and sound to detect intruders. When intruders approach, sheep will tend to move so the guardian animal is between the intruder and themselves. The donkey’s loud brays and quick pursuit will quickly chase predators out of the pasture. When seeking a donkey as a Guardian, 2 standard size jennies (females) or 2 standard size gelded males are the most effective. It is important to have two donkey guardians, as they are very social and tend to be much calmer and content in each other’s company….and therefore more effective guardians. When introducing the donkeys to the sheep or goats (or other livestock under their care) they should be placed in a pasture next to, but separate for a period of 1 to 2 weeks. They then can be placed in the same pasture but should be watched carefully initially for any signs of conflict. If you have herding dogs, both the dogs and donkeys will adapt to work with each other, if you take the time to introduce them to each other. Though donkeys are aggressive toward canines, most are docile and gentle with humans. Donkeys are most effective in smaller, open pastures of less than 600 acres, and watch over not more than 200 ewes or goats. Larger pastures with rough terrain and dense brush, where sheep and goats are scattered, lessens the effectiveness of the donkey. Donkeys should never be made to guard pigs, as they would often be forced to stand in mud. Donkeys are from the deserts, and if forced to stand in mud, their hooves will rot.